Numark's NS7 promises to put you in complete control. NAMM 2015: Numark is hoping to tempt users of the Serato DJ software with the NS7III, a serious new 4-deck controller that offers motorised platters and three hi-res colour screens. Two of these displays feature moving waveforms, playhead, deck, and FX status, while the third, central screen gives you a dedicated view of your track library. This display can also show parallel waveforms to enable accurate beatmatching. The theory is that, with the NS7III under your hands, you won't need to look at your laptop at all. Like its predecessor, the NS7II, the new controller is made of metal, features a 4-channel mixer, comes with touch-activated controls and includes MPC-style performance pads. 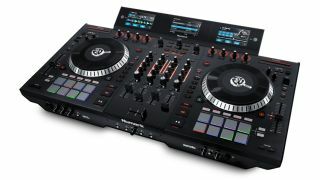 It promises plug 'n' play compatibility with Serato DJ. Expect to see the NS7III in stores later in the year priced at £1200. You can find out more on the Numark website.